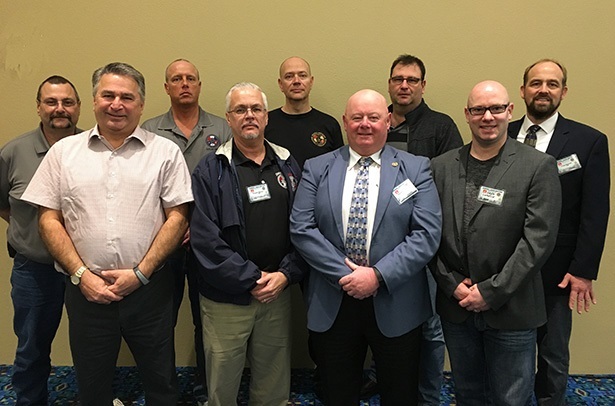 The IAM was well represented when leaders from the U.S., Canada and Germany took part in the 3rd annual multi-union Siemens meeting in Orlando, FL. Front row from left: District 11 Business Rep. Claude Boisvert, District 65 Assistant Directing Business Rep. Ron Warner, Director of Collective Bargaining Tom O’Heron and Local 868 Vice President Frederic Labelle. Back row from left: Local 1580 President Jim Lewis, Local 1580 Vice President Bryan Fanton, Local 2468 President George Zoni, Local 869 President Luc Frigon and Collective Bargaining Coordinator Department Craig Norman. Leaders from the IAM and other U.S. unions recently took part in the 3rd annual Siemens multi-union meeting in Orlando, FL. The IAM has a long-standing relationship with IG Metal, the German metalworkers union, and the Siemens Works Council, which also participated. Common issues for all the organizations with members working for Siemens globally were discussed. With over 50,000 Siemens employees in the US workforce and just over 3,600 union members, organizing was a main topic of discussion. The difficulties with organizing in the U.S. were shared with our German brothers and sisters. A significant part of the discussion focused on efforts to make sure that Siemens fully respected international labor standards with regard to organizing and collective bargaining. All the unions involved expressed their commitment to finding an effective strategic approach to take for the future. Health care, pensions and job security at US Siemens locations are among the issues discussed by the union leaders. A great deal of information was shared and a workshop held that allowed these topics to be discussed from both a local and international level.